Many job opportunities are available for cashiers. From small to big-box retailers, you’ll find employers that are hiring. Most positions offer a flexible schedule, and you may be able to select the hours you’re available to work. Companies are often willing to work around school schedules for students as well as parents. What’s involved in being a cashier? Cashiers operate cash registers. Most, but not all, work in the retail industry. In small stores, all personnel may take their turn at the cash register, no matter what other responsibilities they have. Larger locations typically maintain an entire division of associates who work primarily or even exclusively as cashiers. 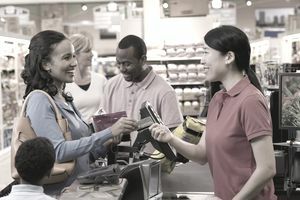 Often, the cashier position is treated as a stepping-stone to more prestigious positions, such as sales associate, but there are career cashiers as well. Cashiers answer customers questions about merchandise and store policies. Processing returns and exchanges may also be something they do. Cashiers are responsible for promoting store credit cards and rewards programs, and often help to shelve merchandise and clean establishments. They count and reconcile cash and credit card receipts at the beginning and end of shifts. The Bureau of Labor Statistics (BLS) expects little or no change in job growth for cashiers from 2016 to 2026. The trend toward self-service checkout and the increase in online retail purchasing will limit opportunities. However, there were over 3.5 million cashier jobs in 2016. According to the Bureau of Labor Statistics, the average hourly wage for cashiers in May 2016 was $9.70. The lowest 10 percent earned less than $8.24 per hour while the top 10 percent earned at least $13.83 per hour. Many states and cities are instituting increases in the minimum wage, which will enhance the wages for some cashiers. Retail stores that are seeking cashiers require a very specific skill set in their job candidates. The most sought-after job candidates will, of course, be able to describe job-specific cashier skills on their resume. These include tasks like cash handling, credit transfers, and experience in sales, inventory, merchandising, and customer service. Basic mathematical skills are also required for both entry-level and experienced cashiers. Use the “Qualifications” list included in the job description as your guide. This list will contain basic keywords that you should echo, if possible, on your resume and in your cover letter. Employers often use automated applicant tracking systems that are programmed to sort and rate resumes based on how often they use job-specific keywords (typically those used in the job description). The more of these phrases you incorporate, the more likely you will land a personal interview. Basically, if a specific skill like “cash handling” is mentioned in the job advertisement, you need to allude to this on your resume and in your cover letter. Ideally, if you already have cashiering experience, you can to provide specific examples of when and how you have used these skills. However, even if you are an entry-level candidate who lacks a certain skill, you can and should still mention the skill on your resume. It’s all a matter of phrasing; whereas an experienced cashier can include a line like “5 years’ experience in cash handling within high-volume retail environment,” an entry-level candidate should say, “Able to leverage strong mathematical aptitude to swiftly master and perform cash-handling functions.” Both resumes will be reviewed because they both use job-specific keywords—and an enthusiastic entry-level candidate who demonstrates how they have transferable skills that will enable them to quickly learn a cashiering skill like cash handling is likely to be seriously considered for employment. Use quantifiable examples of your cashiering skills. If you have cashier experience, try to provide specific examples of how you have successfully utilized your skills in the workplace. This experience can be mentioned both in the initial qualifications summary of your resume and in the career history you include in your “Professional Experience” section. For example, if you have used specific point-of-sale systems, mention these by name. If you have trained others in specific cashiering skills, emphasize this point on your resume. Don’t forget the soft skills. Particularly if you are an entry-level candidate, mentioning solid soft skills will be your key to being considered for a cashier job. Many stores are willing to train new employees on the hard skills needed for the job—technical knowledge such as how to operate a cash register—but they still prefer to hire people who at least possess the soft skills that will allow them to provide a positive store experience for their customers. These interpersonal talents include competencies such as friendliness, proactive initiative, a professional appearance, strong oral communications skills in English and, depending on the location, perhaps Spanish or another language, and the flexibility to work different shifts or overtime. Highlight your achievements and contributions. In order to stand out from your competition, you should highlight previous work achievements both on your cover letter and in your resume. In your cover letter, key achievements will pop on the page if you list these in a bulleted section and selectively use boldface font to emphasize quantifiable numbers or percentages. In your resume under “Professional Experience,” first provide a narrative description of your specific duties as a cashier at your previous employer, followed by a bulleted list of your major achievements or contributions. Separating the achievements from the actual job description helps to showcase them by catching the reader’s eye; these examples will help to provide a convincing argument for an employer to give you a personal interview for a cashier position. This is an example of a cover letter for a cashier position. Download the cashier cover letter template (compatible with Google Docs and Word Online) or see below for more examples. It was with much interest that I learned from your October 21 posting on Craigslist that Acme Groceries is seeking to fill a cashier position. Eager to use these skills to excel as a full-time cashier with [insert name of employer], I would welcome the opportunity to speak with you in a personal interview at your convenience. Thank you for your consideration and forthcoming response. This is an example of a resume for a cashier position. Download the cashier resume template (compatible with Google Docs and Word Online) or see below for more examples. Customer service-oriented cashier positioned to excel within full-time role requiring proven cash handling, issue resolution, and inventory control capabilities. Four years’ experience within high-volume setting, earning multiple awards for excellence in customer service. Solid command of point-of-sale technologies, including use of cash register, computer, telephone, barcode scanners, receipt printers, and debit/credit card readers. Communicate effectively with customers from all walks of life, with native fluency in English and basic command of Spanish. Energetic and dedicated team player, willingly working multiple shifts and overtime to ensure uncompromised coverage of cashier stations. Concurrent with education, worked part-time for established community grocery store. Greeted customers, scanned grocery items, handled cash and credit transfers with 100 percent accuracy. Mastered and utilized state-of-the-art point-of-sale system tools, including cash register, barcode scanner, receipt printer, and debit/credit card reader. Provided friendly and attentive responses to customer queries and issues. Swiftly promoted from bagger to cashier based on excellent mathematical and customer service aptitude. Selected by manager to train new hires in cash register use and cash handling procedures. Willingly stepped up to cover other employees’ shifts in diverse store roles. The duties of a cashier vary somewhat from one business to another, so the necessary skills do as well, but there is considerable overlap. Because most cashier positions are entry-level, they typically include extensive on-the-job training, so you might not need much in the way of focused retail skills when you apply—although prior experience does not hurt. Being able to demonstrate that you already possess many of the necessary skills will give you a leg up on otherwise equally qualified candidates. Here’s a list of cashier skills to incorporate into your resume, and to share with prospective employers. Familiarity with products. If a label has come off, you should be able to identify the item and either enter the product code from memory or direct someone to find the correct barcode quickly. You can also add significant value to a customer’s experience if you know enough about your store’s products to notice if an item is damaged or to answer questions about the item. What Are the Skills Needed for Research Assistant Positions?